READING Museum is celebrating national ‘Explore Your Archive’ week, with a focus on a particularly poignant piece of personal memorabilia from World War I. 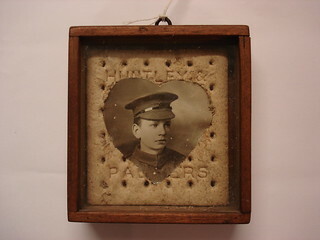 No 4 H&P Army Biscuit is a Huntley & Palmers Army Biscuit, used as a make-shift frame for a photograph of soldier, Rifleman George Mansfield. He mounted the biscuit frame and heart-shaped portrait inside an old, wooden cigar box with a glass cover. The object is a young soldier’s touching gift home to his mother when he was far away from his loved ones. Aged just 17, Private Mansfield served with the 60th Battalion (London Division) of the 2/21st London Regiment in Palestine and on the Western Front. Cllr Sarah Hacker, Reading’s Lead Member for Culture, said: “I’d encourage young and old to visit the museum during National Explore Your Archive Week and celebrate the wonderful treasure-trove of history Reading Museum has to offer.